I’m excited to see this sale again! I grabbed one of these sets last time and was very happy with my purchase. 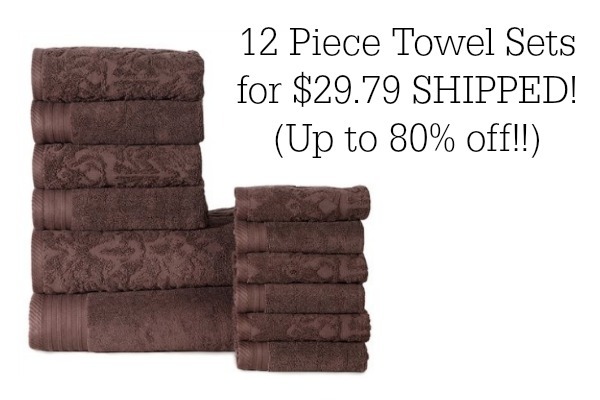 Right now you can score a 12 piece towel set for $29.79 shipped! Go here to see the entire selection. While this sale runs through Wednesday, I believe that the $29.79 price might be today only (according to the sale page). The other thing that I love about this sale? They have a wonderful selection to choose from and you will have your choice of FOUR bath towels, four hand towels and four wash cloths or TWO bath towels, four hand towels and six washcloths. They also have a separate sale (called the White Sale) where you can purchase 6 piece towel sets for $19.99, so make sure to take a peek at that sale as well! Once you order off of Zulily, you will have FREE Shipping on additional orders placed before midnight (pt) of that same night, so I usually order ONE item (to pay the lowest shipping cost) and then go back and make any additional purchases. PLUS if you order on a Friday, you will get FREE shipping through Sunday night!